A special type of steel alloyed with tungsten is produced and rolled into strips. The blades are then stamped out of the alloyed steel using stamping machines. The saw is ground to specifications. 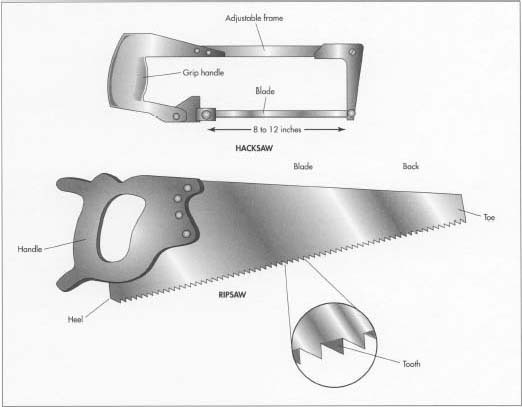 Gauges are used to measure the angle of the saw's teeth, which determine its effectiveness in cutting. The blade is then hardened, and the handle is attached. into the wood grain without chiseling it. Conversely, the cutting edge of the ripsaw is set at right angles to the actual blade, so the teeth act like little chisels. A hardwood saw's teeth are optimally angled at 60 degrees, while softer woods must be cut with teeth set at a more acute angle, generally 45 degrees. Seasoned and green woods also call for differently shaped blades. A coarse saw has about five teeth per inch (two per cm), which is best when cutting green or soft wood. 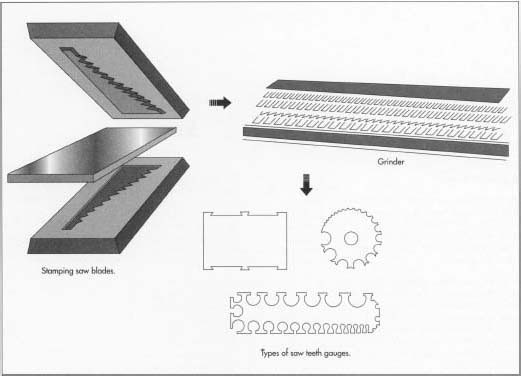 A fine saw, with at least eight teeth per inch (two per cm), can make smooth cuts in seasoned hardwood intended for show, or for more intricate constructions like dove-tailing. so teeth are measured with a gauge made of plate steel that analyses three teeth at a time. Then, they are cut and bent in altemating directions. Too much angling away from each other, however, results in a saw that does not cut properly.